Take a little more transit and eat a little less meat — two things you can do to reduce your impact on the environment. In this installment of Meatless Mondays with Metro, let’s take a trip to Tocaya Organica in West Hollywood. Tocaya Organica specializes in modern and organic Mexican cuisine. Their traditional Mexican recipes are meshed with vegan, vegetarian and gluten-free accommodations. With a variety of salads, bowls, tacos and burritos, there’s something for everyone to try. 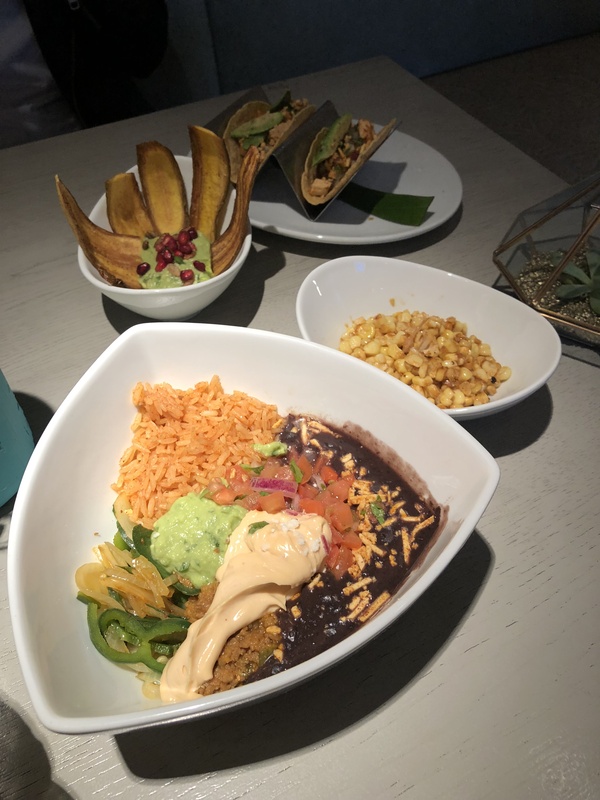 The fajita del rey bowl with vegan picadillo uses pea-based protein and is full of natural flavors that include poblano peppers & onions, Spanish rice, black beans, vegan chipotle crema, guacamole and pico de gallo. My favorite item on the menu is the guacamole served with plantain chips. The pomegranate seeds and lime pepitas add a special twist to a traditional guacamole — plus, i don’t feel so guilty eating plantain chips since it’s technically a fruit. To get to Tocaya Organica, take Metro Bus 2/302 to the Sunset/Sunset Plaza stop and walk one-tenth of a mile west on Sunset Boulevard. Additionally, there are two other locations: Santa Monica and Venice. To reach Tocaya Organica Santa Monica, take Metro Bus 20 or Rapid Line 720 to Wilshire/6th and walk approximately 200 feet west on Wilshire Boulevard. To reach the Venice location, take Metro Bike Share to Venice/Pacific and walk one-tenth of a mile north on Pacific Avenue, or take Culver CityBus Line 1 to Pacific/Venice Way and walk approximately 300 feet south on Pacific Avenue. If you’re going to the Santa Monica location, the closest westbound line 720 stop is actually a few blocks away at 4th/Arizona. Only the eastbound line stops at Wilshire/6th – which makes it useful if you’re transferring from the Expo line terminus. Metro’s line 20 only goes as far as Westwood until around 8pm; during the day, the Big Blue Bus line 2 does local service on Wilshire to downtown Santa Monica. It would be helpful to actually give the address to the restaurants that you are discussing. People may be coming from different locations, located near different routes, using rail, taking a bike, etc. A single description that assumes that their are coming from downtown doesn’t cut it. Also, more spacial diversity is need. Looking at the map, there are no places in the SFV (and there are vegan places in the Valley), almost nothing in the SGV (there are places), and mostly nothing south of DTLA until the LBC. And don’t forget the AV (Metro does forget that they exist). Hello, thanks for the suggestion. I can include a link with an address in future post. Please feel free to list any suggestions of vegan restaurants in the valley, I would love to check them out. I will also do my own research to provide more coverage of Los Angeles. A few, just to show that there are some (using personal knowledge and HappyCow.net) avoiding chains. I have noted a single “vegetarian/vegan friendly”, all others are either vegan or vegetarian. Google Leonore’s Mexican (there are 2 locations with slightly different names). Leonore’s is now vegan. Hello! There’s this Vietnamese Vegan restaurant I really love in Reseda called Vinh Loi Tofu! It’s located at 18625 Sherman Way #101, Reseda, CA 91335 and is accessible by Metro Lines 162/163 at Sherman Way/Amigo or Lines 240/744 at Reseda/Sherman Way. You should check it out!